As Bill Hanney’s Theatre By The Sea picks up speed in its 85th Season, all the buzz is concerning their second offering, the ABBA-inspired jukebox musical, Mamma Mia!. Hanney’s excitement about securing the rights to one of the more popular pop-infused Broadway gems was palpable even last year when he told Motif that he was working on “something big.” He knew even then that TBTS’ usual four-week run length would have to be expanded in order to accommodate the ticket demand, and he was certainly correct. “This is the first time in Theatre By The Sea history that a show has had a five-week run,” he tells Motif, clearly relishing being correct in his anticipation. “I’m also proud to say that all sets and costumes are designed and built by us.” Not succumbing to rental shops may seem a small thing about which to crow, but Hanney’s effusive praise of all things TBTS (and his companion company, North Shore Music Theatre) is rarely, if ever, overdone. In fact, there can be efforts that seem to pass almost unnoticed in the wake of a behemoth like Mamma Mia! (as well as the upcoming season-closer, Chicago). Of particular note is this year’s opening salvo, the Fats Waller showcase Ain’t Misbehavin’. 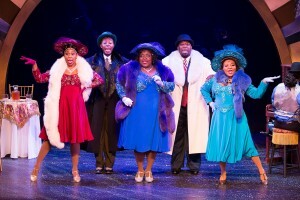 While it’s now too late to take in this salacious romp of a revue (the run ended on Jun 17), Misbehavin’ more than equaled its season-opening counterparts of years past. While Hanney’s formula of opening “light” (small cast, easy staging, familiar standards) is self-deprecatingly referred to as something to hold a place before the tourists show up in force, TBTS has upped the ante every year in this time slot. Last year’s Beehive was actually fairly ambitious in scope for a supposedly “light” time slot. Where that effort fell short, however, was in a young cast (however talented), that did not quite understand the time period with which they were dealing (the 1960s). The five-person ensemble of Misbehavin’ not only fully embraced the Interwar period in attitude and style, but the performances rang true as well, unsullied by modern vocal trills or showboating. Not that the Misbehavin’s cast didn’t have ample opportunity to boast. Tarra Conner Jones and DeMone’s rendition of “Honeysuckle Rose” alone was worth the price of admission, and that was only four numbers into the first half. A familiar nightclub setting, reminiscent of Cotton Club glitz, afforded all the space needed for this cast, and it had a crack orchestra to up the ante over and over. Easing into a slithering, brilliant ode to marijuana (“The Viper’s Drag”) and headlong into the showstopper, “Black and Blue,” director / choreographer Gerry McIntyre delivered one of the most underrated productions seen in Matunuck in quite some time. Asked about his feelings concerning the production, Hanney seems to be constantly in forward motion. “Wasn’t it terrific? ?” is about all we get. His confidence in his choices of material lend Hanney the comfort of stepping aside and watching it all unfold. In fact, Hanney is so comfortable in his ability to program a successful season he is now inviting audiences to help him decide. A recent survey sent out to email subscribers offers up the chance to weigh in on the 2019 lineup, with one winner receiving tickets to July 9’s A Broadway Celebration (featuring five Broadway performers, including Wicked‘s Julia Murney). The possible choices are intriguing, including Mame, Titanic, Dreamgirls, The Bodyguard, The Fantasticks and even the possibility of a pre-Broadway tryout. All of the survey options are winners and fit neatly within Hanney’s “formula.” One may wonder if that opening slot will eventually run out of contenders, but his possibilities (which include the Sun Studios “dream team” musical Million Dollar Quartet) belie that notion, proving that the season opener is no mere placeholder. And that’s it. Much has been praised concerning the show’s strong feminist stance and its ability to gender-swap some of the original ABBA material, leaving strong female characters in control of their own destiny. All good stuff, but what really gives Mamma Mia! its wings is nostalgia. The material in Ain’t Misbehavin’ is light years ahead of the breezy pop written by Sweden’s proud progeny, but nostalgia relies on joy and tends to be viewed through the lens of innocence. As deserving as Fats Waller is of timeless recognition, no one is staging a Waller world tour complete with holograms and newly recorded material (ABBA, however, is undertaking such a venture). There is an appetite for whatever sugary buzz an ABBA song brings, and although many a classic rock band has had their hits transferred to the stage, only ABBA has survived (and thrived) in such a fashion. Hanney knows a hit when he has one, and he has five full weeks to relish in his impending success. Let’s see what next year brings. Bill Hanney’s Theater By The Sea presents Mamma Mia! Opening June 22. Performances are scheduled for Tuesday through Saturday evenings at 8pm, Thursdays at 2pm, Saturdays at 3pm and Sundays at 5pm, with special performance times on Sunday, June 24 at 2pm & 7pm and special added matinee performances on Tuesday, July 3 and Wednesday July 18 at 2pm. The theater is located at 364 Cards Pond Rd, Wakefield. Tickets are on sale at the box office Monday through Saturday from 11am – 6pm, Sundays from Noon – 5pm and performance days until curtain, online 24-hours-a-day at theatrebythesea.com and via telephone during normal box office hours by calling 866-811-4111 or 401-782-TKTS (8587).